Miyazaki’s vision of Howl’s Moving Castle is perhaps the most lucid of all his cinematic creations. Based loosely on the book by Diana Wynne Jones, Howl’s Moving Castle is the tale of a young girl’s adventures with a foppish young sorcerer and his motley “family” in his fantastical walking castle. Those who are usually uninterested in the subject matter of his previous films (Spirited Away, Princess Mononoke, etc) can rest assured with this one: it’s a fairly linear tale that only confuses in certain parts. Rachel (Emily Mortimer) lives in a fictional world that seems reminiscent of pre-World War I Germany. Intensely vibrant and saturated with spot color, her world is immediately pleasing to the eye and engulfs the viewer to feel at ease in this cinematic reality. On her way home, Rachel is rescued by the typical Japanese girly-man Howl (Christian Bale) and is later assaulted by the Witch of the Waste (Lauren Bacall), who places a curse on Rachel in which she looks like an old woman. 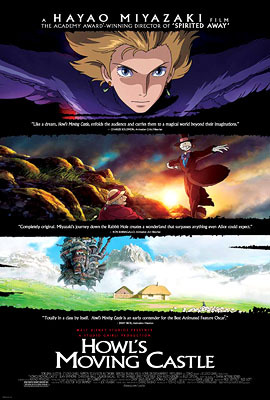 To reverse the curse, Rachel journeys to the Waste and encounters the hopping, silent scarecrow Prince Turnip (Crispin Freeman) who takes her to Howl’s Moving Castle, where she makes the acquaintance of the child magician Markl (Josh Hutcherson) and the adorable yet sarcastic flame, Calficer (Billy Crystal). Thus begins their adventures as Rachel tries to find a cure for herself and Howl tries to stop the kingdom’s reckless and pointless war. Sound confusing? It ought to, given the familiarity that one may have from seeing Miyazaki’s previous material. However, the movie proceeds at a very light pace and is by and large enriching, confined within its own self-regulated rules of how magic works in the world. It focuses largely on Rachel’s effect as an old woman in Howl’s home: her presence literally and figuratively changes the nature of everyone she encounters. I’m sure that somewhere in this film lies buried a moral, perhaps one of “love conquers all” or “be yourself,” but it isn’t explicitly stated anywhere. That is where the movie finds fault: in establishing a delightful environment for incredible characters to interact and grow, by the end of the movie it stumbles in terms of explaining the logistics of things, such as why Howl would eat a star (I’m not kidding) or how Rachel could use a magical tracking device to go back in time. Still, the movie is a veritable feast for the senses and grasps enough of its hair-thin plot to keep things interesting. The characters alone invoke an on-cel presence that easily rivals that of Disney (coincidentally, Howl’s Moving Castle was distributed through Walt Disney-owned Buena Vista Home Entertainment). Whether you’re young, old, or a college geek with nothing better to do, Howl’s Moving Castle is an innocent break from reality that is likely to be seen as time well spent.